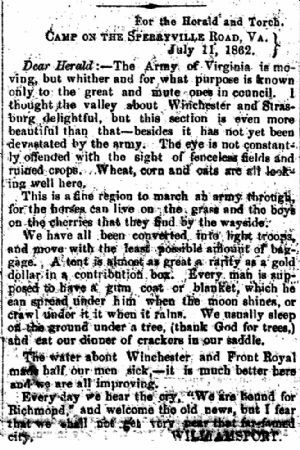 July 16 1862 - On the road to Richmond. Camp on the Sperryville Road, Va. The Army of Virginia is moving, but whither and for what purpose is known only to the great and mute ones in council. I thought the valley about Winchester and Strasburg delightful, but this section is even more beautiful than that—besides it has not yet been devastated by the army. The eye is not constantly offended with the sight of fenceless fields and ruined crops. Wheat, corn and oats are all looking well here. This is a fine region to march an army through, for the horses can live on the grass and the boys on the cherries that they find by the wayside. We have all been converted into light troops and move with the least possible amount of baggage. A tent is almost as great a rarity as a gold dollar in a contribution box. Everyman is supposed to have a gum coat or blanket which he can spread under him when the moon shines, or crawl under it when it rains. We usually sleep on the ground under a tree, (thank God for trees,) and eat our dinner of crackers in our saddle. The water about Winchester and Front Royal made half of our men sick,—it is much better here and we are all improving. Everyday we hear the cry "We are bound for Richmond" and welcome the old news, but I fear that we shall not get very near that famed city.